SPA Professor Jan Leighley (left) moderates a bipartisan discussion with David Brat (R-VA) and Jamie Raskin (D-MD). 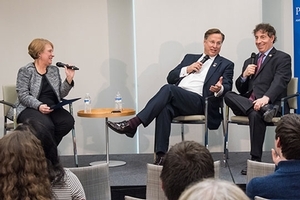 The American University School of Public Affairs (SPA) hosted U.S. Democratic Rep. Jamie Raskin (D-MD) and Republican Rep. David Brat (R-VA) on campus for a discussion that highlighted the lawmakers’ philosophical differences and, more importantly, their areas of common ground. The event was not about changing minds; instead, it aimed to encourage dialogue and build trust between parties. David Barker, director of SPA’s Center for Congressional and Presidential Studies organized the event and introduced the congressmen. Brat, an economics professor who earned a doctorate at AU, stunned the political establishment in 2014 by beating House Majority Leader Eric Cantor in the Republican primary and winning the Congressional seat in the 7th district. Upon taking office, Brat said he was greeted with “open arms” on the Hill and was shocked by how fellow legislators got along – many of whom work out together in the House gym. What surprised Raskin after election to the House in 2017 to represent Maryland’s 8th district was the lack of public hearings that he had been accustomed to in the Maryland Statehouse. “At the heart of the legislative process are hearings, but in Washington you just show up for a markup, then vote,” said Raskin, who was also a long-time AU law professor. Brat explained his conservative ideology was based on the writings of James Madison and Adam Smith who emphasized a smaller federal footprint and advocated for state experiments. Raskin told the audience that he embraced his label as a progressive liberal, noting that those terms denoted liberty and moving forward. Brat and Raskin have clear differences on immigration, health care, and other issues, but they do agree in some areas. They both lamented the role of money in politics, although each noted he won his seat despite being outspent by his opponent. The congressmen each discussed the need for improvements in infrastructure and education but differed on approach and funding. Josee Molavi, CLEG ’21, said the event was lighthearted and civil. Raskin said he hoped students left with a better understanding of the process in Congress.